Home > National Drug-Related Deaths Index 2004 to 2015 data. Health Research Board. 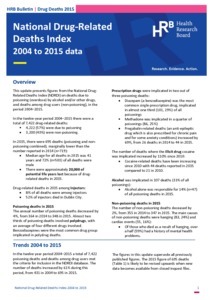 (2017) National Drug-Related Deaths Index 2004 to 2015 data. Dublin: Health Research Board. 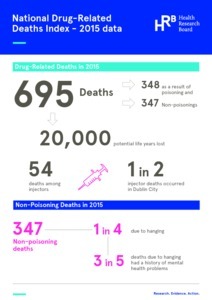 This update presents figures from the National Drug-Related Deaths Index (NDRDI) on deaths due to poisoning (overdose) by alcohol and/or other drugs, and deaths among drug users (non-poisoning), in the period 2004–2015. •	3,200 (43%) were non-poisoning. •	There were approximately 20,000 of potential life years lost because of drug-related deaths in 2015.